A blast from a liquefied petroleum gas leak damaged a restaurant and three of its nearby establishment in Banawe, Quezon City. It is just lucky that there are no casualties reported on the incident. It is not the first time that gas leaks caused enormous damage to property and in times, human lives, here and abroad. For this age that cooking involves LPG, we must be cautious on which cylinders we need to use for our own safety and for the people around us as well. 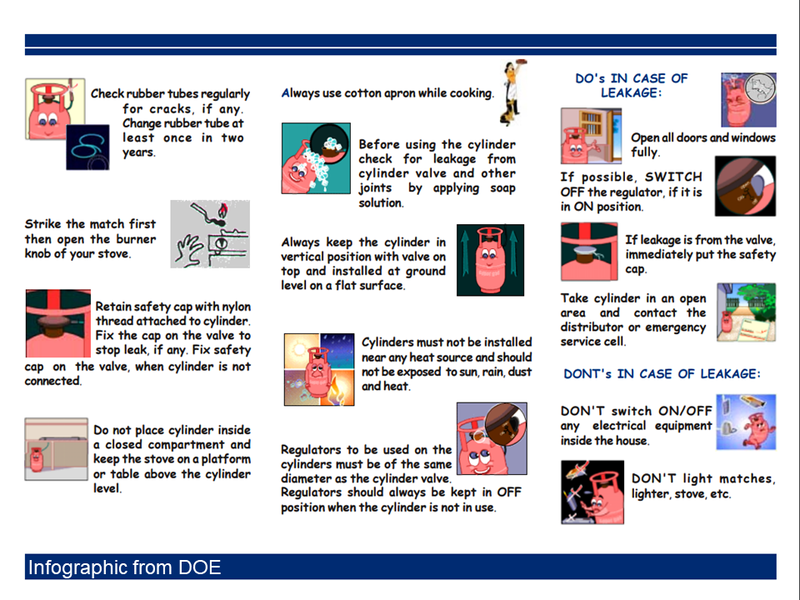 The Department of Energy has released some safety tips to avoid any incidents from happening involving the use of LPG at home or establishments. —Check rubber tubes regularly for cracks, if any. Change the rubber tube at least once in two years. —Strike the match first then open the burner knob of your stove. —Retain safety cap with nylon thread attached to the cylinder. Fix the cap on the valve to stop the leak, if any. Fix the safety cap on the valve, when the cylinder is not connected. —Do not place a cylinder inside a closed compartment and keep the stove on a platform or table above the cylinder level. —Always use a cotton apron while cooking. —Before using the cylinder check for leakage from cylinder valve and other joints by applying soap solution. Cap-on the valve, when cylinder is not connected. —Always keep the cylinder in a vertical position with the valve on top and installed at ground level on a flat surface. —Cylinders must not be installed near any heat source and should not be exposed to sun, rain, dust, and heat. —Regulators to be used on the cylinders must be of the same diameter as the cylinder valve. —Regulators should always be kept in OFF position when the cylinder is not in use. —Open all doors and windows fully. If possible, SWITCH OFF the regulator, if it is in ON position. —If leakage is from the valve, immediately put the safety cap. Take cylinder in an open area and contact the distributor or emergency service cell. —DON’T switch ON/OFF any electrical equipment inside the house. —DON’T light matches, lighter, stove, etc. However, choosing a safe gas cylinder plays a very important role if you want your family and property safe from LPG cylinder explosion or gas leaks. Be sure to buy it from an authorized dealer. Do not accept rusty or old cylinders. Authorized dealers have quality standards on their cylinders, other dealers don’t and chances are you might get an under-filled cylinder. 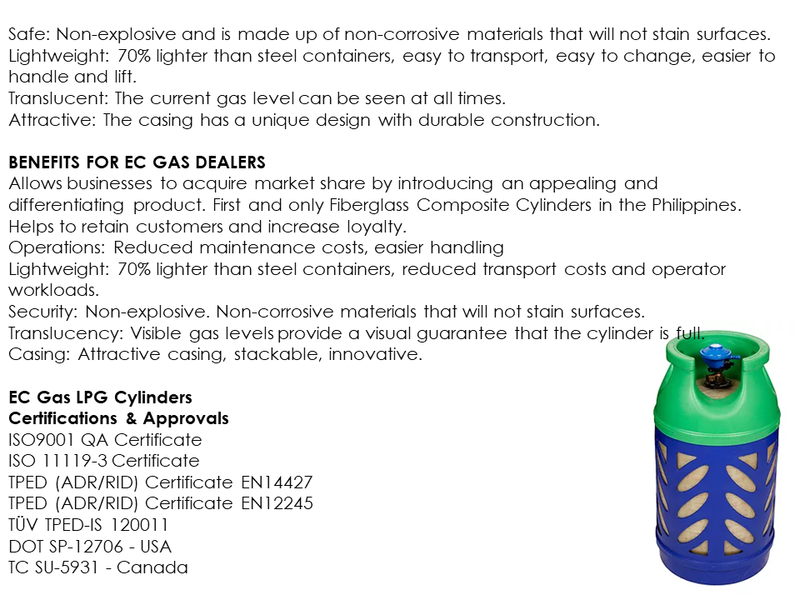 An LPG company claims to be the safest LPG cylinder manufacturer in the Philippines. In fact, they were awarded different citations and certifications involving gas cylinder safety. You can check their store locator HERE. 70% of LPG cylinder users in the Philippines are households. We use it daily in preparing foods for the family. We should not compromise our home for anything less safe. Above cost and economy, safety has to be our foremost concern when buying and using LPG cylinders. Safety always begins with ourselves. Remember, it is always better to be pilfered than having our house burned to ashes.